From inspiration to design advice with crystal-clear how-to instructions, BLACK + DECKER Complete Guide to Bathrooms is the only book you need to achieve the bathroom of your dreams. This brand-new edition of a perennial bestseller from the BLACK + DECKER Complete Guide series is just the book you need if you want to improve, update, or remodel your bathroom. From a simple freshening of the decor to a down-to-the-studs remodel, all of the information you need to design the job and do the work yourself is right here. Through step-by-step photography and instructions, you'll see how to update lighting, ventilation, flooring, surfaces, cabinetry, toilets, bathtubs, and accessories. The comprehensive buyer's guide takes you through one of the most important steps in any remodeling project, and a complete section on bathroom design provides education and inspiration. 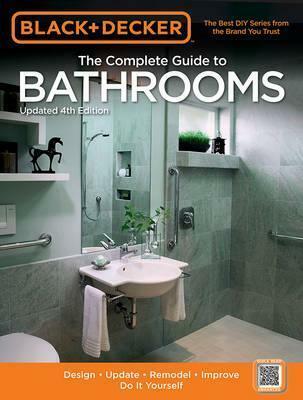 As a bonus, this new edition of Black + Decker The Complete Guide to Bathrooms includes a chapter explaining how to remodel or reimagine your bathroom to better meet the needs of aging in place, with projects that conform to Universal Design Standards. You'll see a start-to-finish demonstration on how to replace a shower or tub with a curbless shower stall. To maximize access, a wall-mounted sink is hung and hooked up - and you see every step. Replace a traditional bathroom sink faucet with a hands-free model so you can turn on the water even if you can't reach all the way to the faucet handle. The editors of Cool Springs Press have produced the highest quality DIY home improvement books for more than 30 years. In conjunction with the experts at BLACK+DECKER they have combined resources to create more than 200 home improvement titles that provide consumers and weekend DIYers with the information they need to get the job done right. Their books have set the standard for do-it-yourself publishing, featuring clear, professional photography and concise step-by-step instructions that get straight to the point. View our full catalog at CoolSpringsPress.com or connect with us on Facebook (facebook.com/QuartoHomes), Twitter (@quartohomes), or Pinterest (pinterest.com/QuartoHomes).